This past weekend I celebrated Venus returning to the exact point she occupied when I was born. Today, I also celebrate the birthday of Inner Makeup, the astrology business and ever evolving spiritual practice I founded two years ago. What do returns mean in astrology, and what do birthdays mean in astrology? Returns do not mean what they do in finance, a profit from an investment, rather, a return in astrology is a recapitulation of a theme, albeit slightly different, as the planetary bodies are constantly in motion. Similarly, a birthday is the exact point where the sun returns when a person or event was born, with slightly different planetary configurations. The theme of my Venus, and her return, is drama, occupying the expressive sign of Leo; thus we endeavoured to celebrate the sweetness of Venus, the brightest “star” in the sky with a grand party where I sang the celestially-themed East of the Sun, West of the Moon. This heavenly configuration also featured the North Node of Karmic Future and Mercury, the planet of communication, in close aspect in the creative sign of Leo. Venus is also a particularly social sign, so harnessing all of this Venusian and Leo energy was paramount. Similarly, the birthday chart of Inner Makeup also featured Venus prominently, with a similar prominence in the chart emphasizing Venusian energy. But besides the sweet indulgences of Venus, how does one go about celebrating astrological phenomena? In Western astrology, the signs symbolize the seasons, which is a wholly different conception of astrology from Indian astrology, or even NASA, whereby the signs as constellations take precedent. Western astrology is based on the sun, the amount of light shed throughout the year, and its subsequent creation of the seasons as experienced on earth. Thus, we endeavoured to offer seasonal delights for our guests to celebrate each sign, or season. Take a look below to see our interpretation of each dish as embodying each season. The Sun is exalted in the sign of Aries, the fiery, powerful manifestation of spring's awakening, the spring equinox. For this, we selected spring lamb, a robust, aggressive choice paired with chimmichuri sauce. If Aries is the violent burst into spring, Taurus is its beautiful flowering. 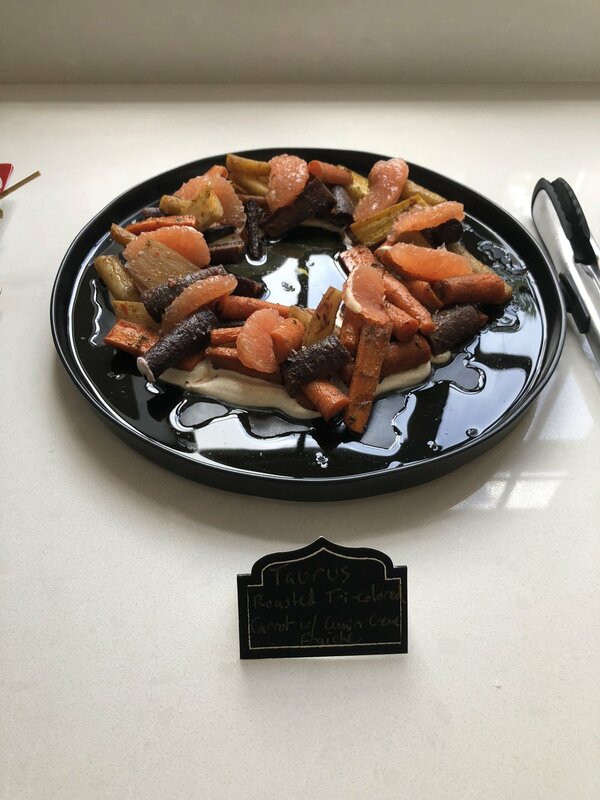 For this spirit, we chose earthly tri-colored carrots paired with cumin creme fraiche. Gemini are the children of the zodiac, and exhibit a sunny, airy, playful, curious, and mischievous duality, embodying the sunniest time of the year. 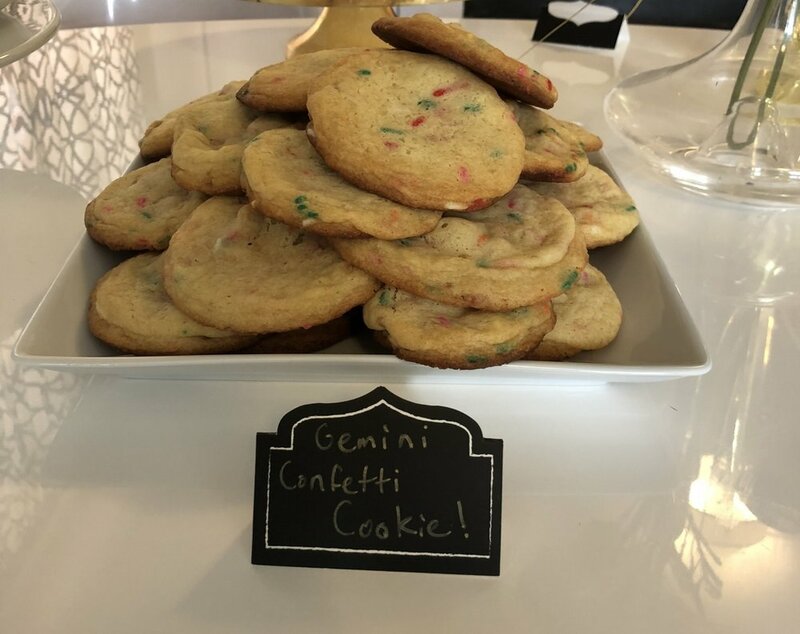 Confetti cookies were the natural choice! Perhaps the easiest selection of the bunch, Cancer is the ancient crustacean. 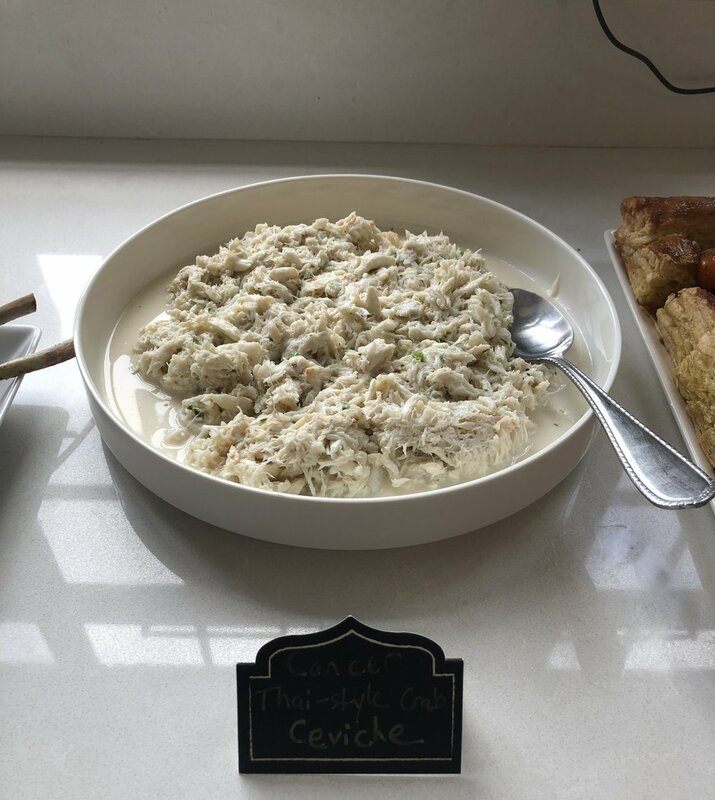 For this we spruced up the ceviche with a Thai-style crab. The sun finds its home with the lion, the fixed, lazy days of late summer. Sweet tomatoes are to be found, and we prepared a dramatic roasted cherry tomato tart. Libra is literally the fall of the sun, the autumnal equinox that sheds equal day to night. Yet the fall, like love, is beautiful, and we prepared an apple pie cake to symbolize this most beautiful time of the year. 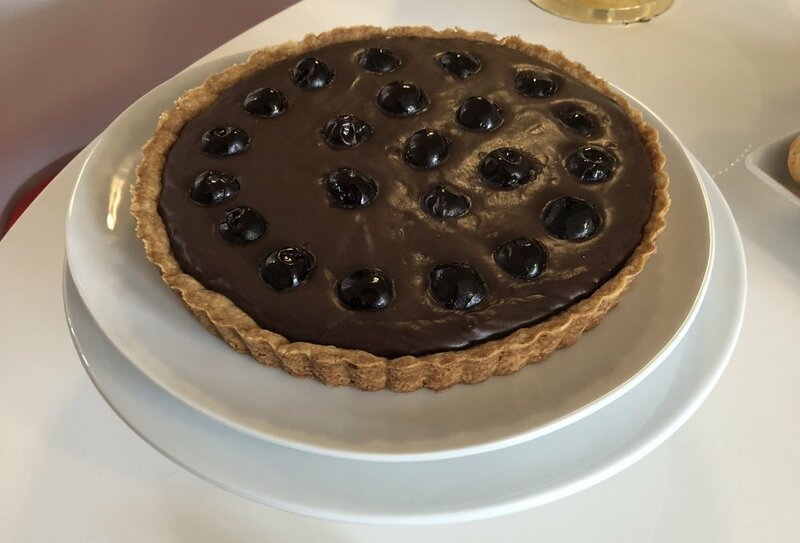 The most intense sign of the zodiac, where the beautiful leaves of autumn are undertaken by the sting of the scorpion, we sought to create the most daemonic dish, a dark chocolate ganache with amareno cherries. To capture the blunt, forward spirit of Sagittarius's arrows, we offered antipasto spears. 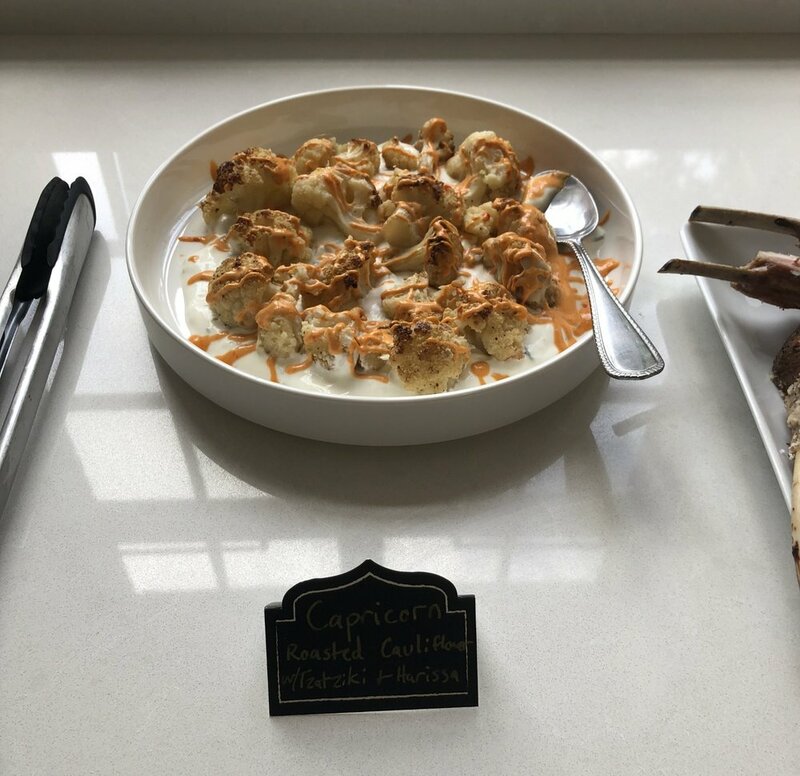 The grounded, conservative nature of Capricorn was captured in roasted cauliflower with tzatziki and harissa sauce. Along with the crab, Pisces was somewhat easy to embody, the fish. 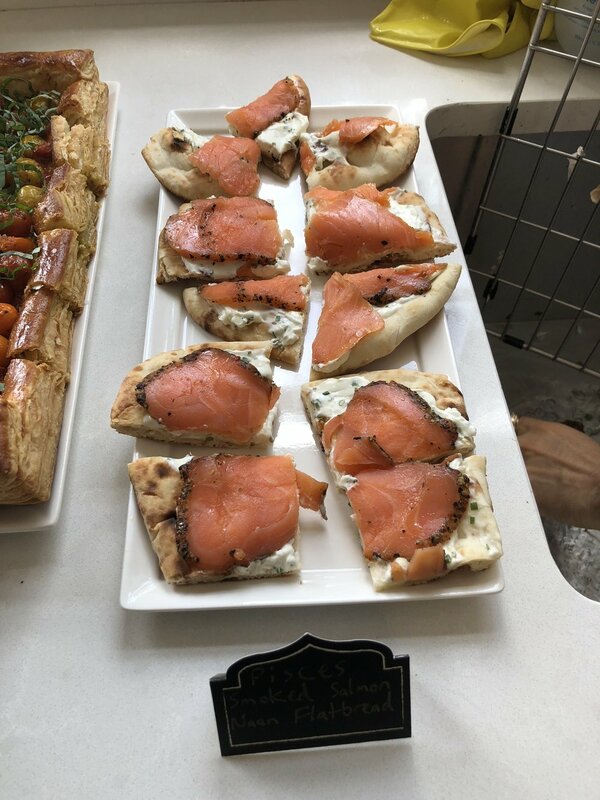 Last but not least, we prepared smoked salmon on naan bread. Apologies to Virgo and Aquarius, as we missed photographing you. Virgo was a virgin rose and Aquarius was an innovative orange blossom spherical ice cube drink. How are you reflected in the seasons and signs of astrology? Contact me to book an Inner Makeup session to explore your personal astrology.